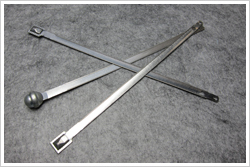 Metal security seals offer slightly more resistance and strength than their plastic counterparts but can still be broken by vigorously bending the aluminium strip. They are used for transport applications such as rail cars, tanker trucks and trailer doors. The Flat Metal Seal is an economical flat-type metal truck seal with rolled edges for easy of handing. It provides high level of security due to its all metal locking mechanism. The Globe Metal Seal is a fixed length metal trap seal that features a locking mechanism totally enclosed in the head, which is secured by two independent spring rings.